The final installment of building a ukulele from a kit. 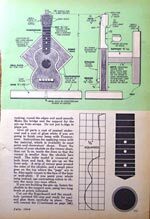 Part 3 of Building a ukulele from a kit. Gluing on the neck and fretboard. Part 2 of building the Grizzly Ukulele kit. Making and installing the maple edge binding. Part 1 Building a ukulele from a kit. Making a custom fretboard.